Creating the prereq works fine, but is there a way to include the files in a single exe? If I don't want to distribute the ISSetupPrerequisites folder (because we have a single exe file hosted on a web site), how do I bundle it all together? When you build your MSI that consumes your Setup Prereq, use the Release Manager settings to build it as a single EXE. It'll be big ( because it contains your MSI and your prereq ) but at runtime it will extract itself to a temp folder and present the same user experience. 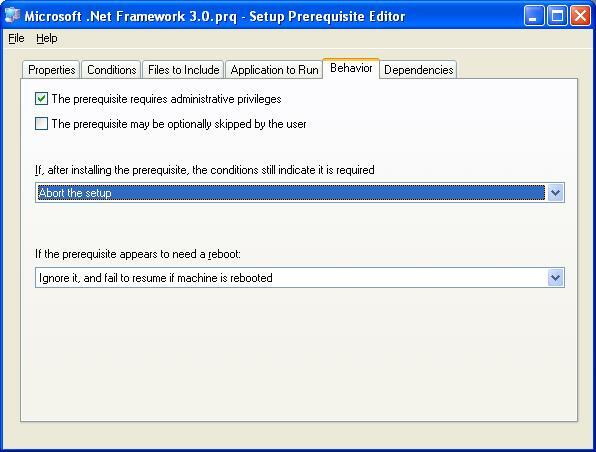 It is also possible to host your prereq on a website and tell your setup.exe to find it. This your user downloads a smaller setup.exe and the prereq is only downloaded if it needs to be. I need to install MSXML 6.0 before the SQL 2005 Express pre-requisite and I saw your comments to a post on how to do this on the InstallShield Community. Thanks for the info. I just don't understand how to do: "When you build your MSI that consumes your Setup Prereq, use the Release Manager settings to build it as a single EXE. It'll be big ( because it contains your MSI and your prereq ) but at runtime it will extract itself to a temp folder and present the same user experience." - How do I build an MSI that consumes my setup prereq through installshield? I'm sorry for not being more detailed in explaining how to consume the setup prereq. Under Application Data | Redistributables filter on "Setup Prerequisite" objects. Now select your prereq and that will cause it to be consumed when you build your release. Thanks a lot. I got the prereq (for SQL Server 2005) in the installation. 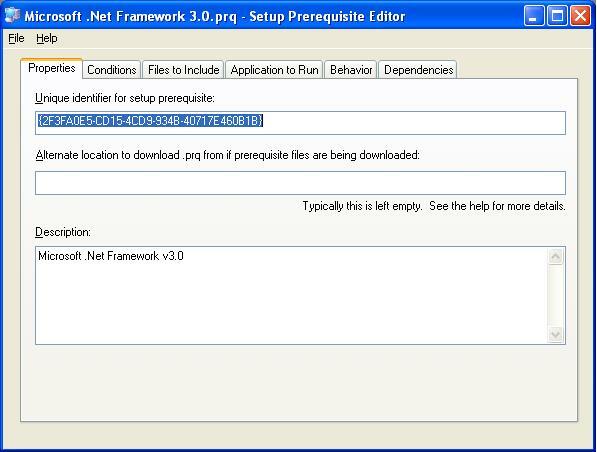 However, when I compile the ise file as SingleImage, the prereq does not become part of the setup.exe file like I want. There is a separate folder: ISSetupPrerequisites, which I don't want. Like "Shadow" mentioned above, I want it to be a single setup.exe (even if it is very large). I even tried right-clicking on the prereq, selecting properties & setting the Build Location to "Extract from Setup.exe", but it doesn't seem to help. 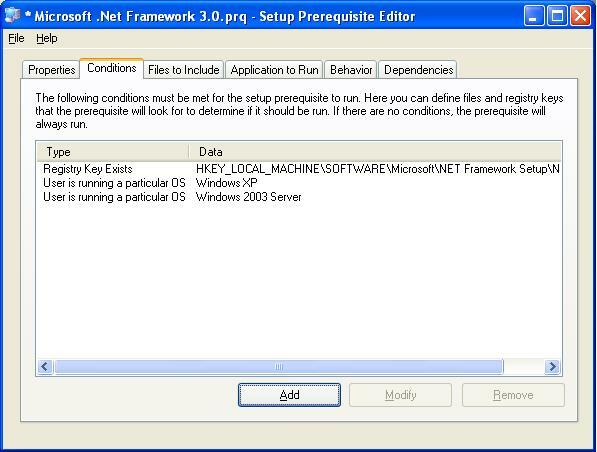 Is there something else I need to do bundle the prereq within the setup.exe file? When you run the release wizard, select web media type and then One Executable - All files are included in Setup.exe. Then a couple screens later select Extract Setup Prereqs from Setup.exe. You'll also want to select the "Cache installation on local machine" option as repairs are pretty hard to do with out having access to the MSI file that did the install. Also keep in mind proper manifesting/elevation of setup.exe on Vista machines otherwise you won't have priv to cache the MSI. Thank you for posting this Christopher. I've been looking for a way to do this with the .NET 3.5 Framework. My company doesn't want to upgrade to IS2008 unless it is necessary. The other settings are all there already. I wrote this article in November of 2006 and Macrovision later released their own .NET prereq. Their implementation was a little bit different and there is nothing in it that prevents it from being consumed by InstallShield 12 as the PRQ XML syntax is the same. Technically you might be in redist violation because of the included Helper.exe but there is no technical reason why it can't be done and they haven't really done anything ( like protect the download or have setup.exe create a IS2008 Mutex that the Helper.exe checks for at runtime ) to prevent people from doing this. 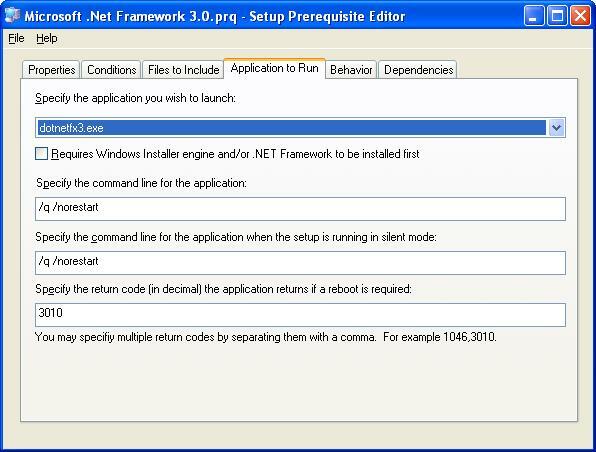 I used this method to install .NET Framework 3.5 SP1 with Installshield 12. It works very well but I'm not able to to prompt the user for a reboot only if required. I use a ScheduleReboot Action wi th no conditions, but this always prompts the user for a reboot even if .NET Framework 3.5 SP1 it's already installed. Is there a way to prompt the user for a reboot only if required? It seems that the return code 3010 it's ignored by Installshield. I was wondering if I can put a conditition in ScheduleReboot action that is based on the return code of .NET Framework 3.5 SP1 prerequisite. 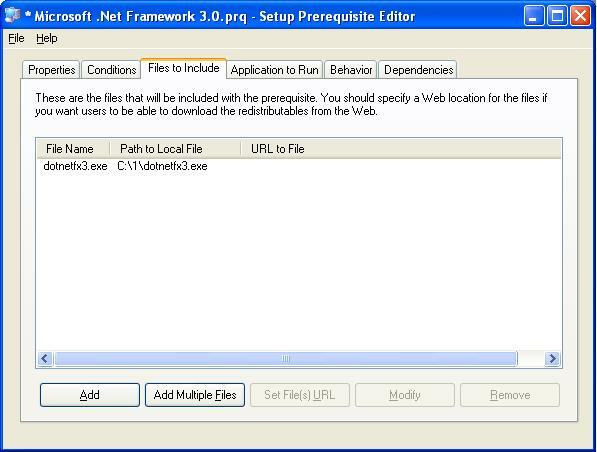 I used this method to make .NET framework 3.5 as a prerequisite for my application. This works good. Actually my application installer is 1 single EXE wherein i download the .NET 3.5 bootstrapper exe from the internet. Once the boot strapper finishes installing the framework , instead of continuing with actual installation process , the installer quits. 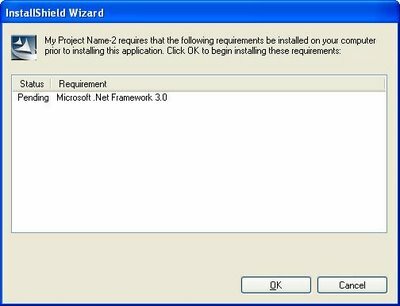 I have to execute the application installer again to complete the application installation process. Could you please suggest what you think could be causing the application installer to quit right after installing pre requisites instead of continuing further. 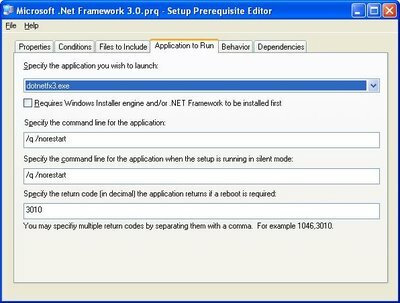 Are prereqs supported in Installshield 2010, Installscript based projects? I tried adding .Net 3.5 as a prereq and it didn't get installed. After running setup.exe with .net framework added, it shows 'pending' and I have to manually click on 'Install/OK'. Is there any way to automatically install it without user interaction or without user having to click on Install.